Los Osos High School wide receiver Caleb Repp has committed to University of Utah, following a visit to that school last weekend. The 6-foot-5 senior standout has 22 receptions foe 430 yards and five touchdowns, the longest being an 80-yard play. With half the season left he is almost up to what he managed last year. As a junior he tallied 27 catches for 502 yards and seven touchdowns. Repp also had a visit planned to Nevada and was going to schedule on to University of Texas-El Paso with the latter being for track. 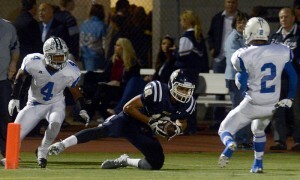 The Grizzlies play Silverado on Friday for homecoming.